The harmful consumption of alcohol is associated with a range of health and social consequences, including injuries, several forms of cancer, chronic liver disease, heart disease, alcohol dependence, and domestic violence. Priority cross-cutting issues for the program include: gender, human rights, health promotion and services in primary health care. Alcohol consumption in Africa is approximately 45% greater than the global average. In 2000 alcohol was the most important risk to health in low and middle income countries in Africa. Illicit drugs ranked 8th among the 10 leading risk factors for Africa. The average drinking pattern of adults in the majority of countries in Africa is hazardous to health. It is estimated that in the year 2013, alcohol led to the death of one person every 100 seconds in Africa. 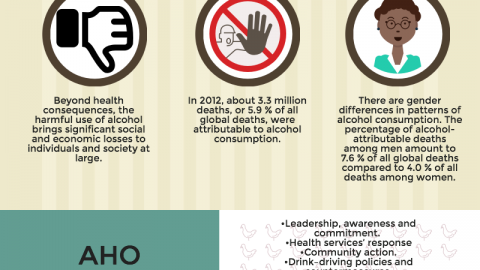 Health services to deal with alcohol use disorders are lacking. Stigma and discrimination against people with alcohol use disorders hinder their access to health services and treatment.